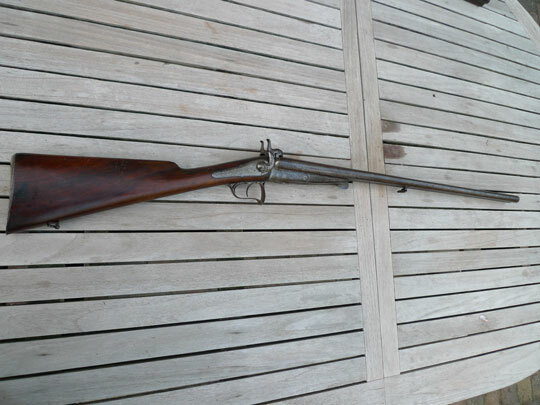 Excellent French double barrel pinfire shotgun Lefaucheux system Kal.16. Excellent damascus barrels with proof marks. 42 in an oval and two others. Length 72 cm/23 inch. Breech and other parts are marked; BU.Excellent figured English style walnut stock with owners initionals GB gold inlaid on trigger guard. Good working locks are signed with maker's name and Saint Ettienen (Hard to read). Heavy hammers.